(339/15) 265 Eddy Street; Metropolitan Garage, Roosevelt Garage (1983). 400 car parking garage. 4 stories; reinforced concrete structure; stucco and cast concrete facade, buttresses, decorative spandrel panels, peaked windows, belt course, cove cornice; three-part vertical composition; Gothic ornamentation; blade sign with metal armature covered by plywood. Alterations: sign altered. Original owner: Joseph Pasqualetti of American Concrete Company. Architect: Henry Clay Smith. 1924. (339/15A) 245-253 Eddy Street; Standard Apartments, Harriman Apartments. Apartment building with fifty-four two-room units. 6B stories; steel and reinforced concrete structure; stucco facade with arched entry, belt course, cornice; two-part vertical composition; Renaissance/Baroque ornamentation; vestibule: vaulted space with marble floor; lobby: pilaster order, marble floor. Alterations: security gate, aluminum windows, storefronts partly remodeled, aluminum replacement door. Owners: William Helbing Company (1924), Fay Hong Wong, Yick Fun Wong, and Jun Lee Wong (1982), Aspen Group (1983). Architects: William Helbing Company (1924), George Miers (1983). 1924-1925. 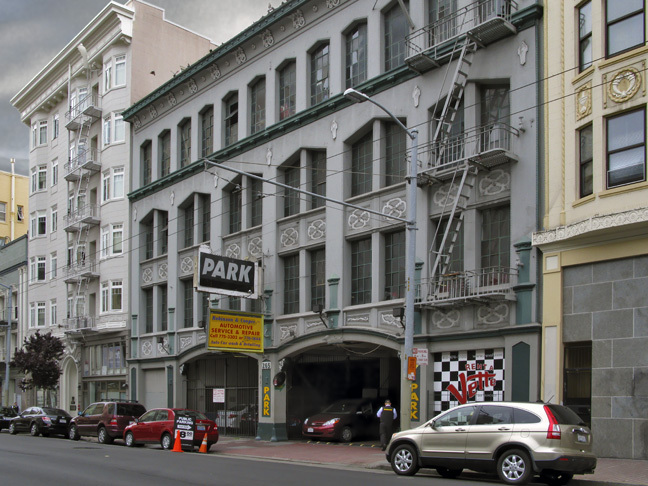 Known as “the hillside architect” for his signature talent of siting buildings in San Francisco’s hilly terrain, Henry Clay Smith also designed two buildings in the Tenderloin: the Metropolitan/Roosevelt Garage on Eddy Street and the Bernard Apartments at 222 Leavenworth.